Manufactured in a facility that also produces milk and soy products. (calcium phosphate, magnesium oxide, sodium ascorbate, niacinamide, ferric orthophosphate, zinc, gluconate, calcium pantothenate, ascorbic acid, vitamin A palmitate, pyridoxine hydrochloride, manganese gluconate, thiamin mononitrate, riboflavin, ergocalciferol, folic acid, biotin, potassium iodide, chromium chloride, phytonadione, alpha tocopherol acetate, disodium phosphate, silicon, cyanocobalamin). (lactobacillus acidophilus, B. longum, L. plantarium), protease enzyme, monk fruit. Mix 2 Scoops With 8 oz of Cold Water or Unsweetened Almond Milk & Shake Well or Blend with other Healthy Ingredients such as Greek Yogurt & Fruit for a Great-Tasting Smoothie. 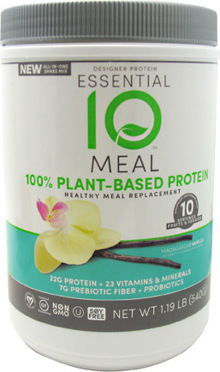 Essential 10 Protein Blend (Pea Protein, Organic Sprouted Brown Rice Protein), Non-GMO Prebiotic Vegetable Fiber, Tapioca Dextrin, Organic Cane Sugar, Cocoa (Alkalized), Natural Belgian Chocolate Flavor, Sunflower Oil, Natural Flavor, Essential 10-A-Day Antioxidant Blend (Green Coffee Berry Extract, Blueberry Extract, Strawberry Extract, Sweet Cherry Extract, Cranberry Extract, Mango Extract, Sprouted Broccoli, Carrot Extract, Spinach Extract, Sprouted Kale, Beet Extract), Organic Guar Gum, Xanthan Gum, Stevia Leaf Extract, Prebiotics (Lactobacillus Acidophilus, B. Longum, L. plantarum), Protease Enzyme, Monk Fruit. Vitamins and Minerals: (Calcium Phosphate, Magnesium Oxide, Sodium Ascorbate, Niacinamide, Ferric Orthophosphate, Zinc Gluconate, Calcium Pantothenate, Ascorbic Acid, Vitamin A Palmitate, Pyridoxine Hydrochloride, Manganese Gluconate, Thiamin Mononitrate, Riboflavin, Ergocalciferol, Folic Acid, Biotin, Potassium Iodide, Chromium Chloride, Phytonadione, Alpha Tocopherol Acetate, Disodium Phosphate, Silicon, Cyanocobalamin). Mix 2 scoops with 8 oz. of cold water or your favorite non-dairy beverage such as unsweetened almond milk & shake well for a great-tasting meal. Use 1 scoop for a light and healthy snack. Essential 10 Meal Replacement contains a complete plant-based protein-rich meal with healthy fats, carbs, fiber and the equivalent antioxidant value of 10 servings of fruits and veggies in every serving. Essential 10 Meal Replacement is a delicious all-in one protein-rich meal that is quick and easy to make. Try it in Madagascar vanilla! There's more to dieting than just cutting calories. You have to maintain a well-balanced diet as well. To do this, eat at least five small meals a day, as opposed to three larger meals. You can control your hunger throughout the day by keeping yourself satiated, but not full. If you don't think you'll have the time to create five small meals, use a meal replacement like this one from Essential 10. Using a replacement shake for one or two of your meals will help you prevent cravings, yet give you a healthy dose of the nutrients your body needs. (Do not replace all your meals at the same time.) Skipping breakfast is a huge no-no. For days that you can't sit down for a meal, throw a scoop in a shake for the road. Smoothies with fresh fruit and Essential 10 make a great, filling lunch. They're also great for a snack between meals or before and after a workout. Research has shown that meal replacement shakes can help you lose weight more than cutting calories alone. Essential 10 Meal Replacement is rich in protein, which has been shown to keep you satiated longer than carbohydrates and fats. A meal replacement shake is an easy and portable way to get vital nutrients your body needs when you simply don't have time to sit down for meals made of whole foods. A shake made with Essential 10 Meal Replacement is definitely preferable to skipping a meal! You'll stay energized throughout the day and keep your metabolism functioning efficiently. Satisfy Hunger: Just 22g of natural, soy-free, non-GMO plant proteins satisfy hunger and help support body tone. Stay Energized: Healthy vegetable-based fats and healthy carbs provide a steady flow of energy. Maintain Metabolism: 21 vitamins and minerals support vitality and energy metabolism. Support Your Gut: Prebiotic fiber, probiotics and digestive enzymes curb hunger and support digestive health. Stay Clean: Certified vegan, gluten-free and kosher, this soy-free, dairy-free, non-GMO meal replacement with no artificial flavors, sweeteners, colors or preservatives provides clean, balanced nutrition every time. 22g of non-GMO pea protein and organic sprouted rice protein, plus 21 vitamins and minerals and healthy fats for a complete, plant-based meal replacement. Contains the equivalent antioxidant value of 10 servings of fruits and vegetables to help support immune health. Manufactured in a facility that also produces Milk, Soy, Coconut, Egg and Fish products. Essential 10 Plant Proteins (Pea Protein, Organic Sprouted Brown Rice Protein), Non-GMO Prebiotic Vegetable Fiber, Tapioca Dextrin, Organic Cane Sugar, Sunflower Oil, Natural Madagascar Vanilla Flavor, Natural Flavor, Tapioca Starch Modified, Organic Antioxidant Extracts (Organic Coffeeberry Coffee Fruit Extract, Organic Blueberry Extract, Organic Strawberry Extract, Organic Tart Cherry Extract, Organic Cranberry Extract, Organic Mango Extract, Organic Alkalized Cocoa, Organic Sprouted Broccoli Extract, Organic Carrot Extract, Organic Spinach Extract, Organic Sprouted Kale, Organic Beet Extract), Xanthan Gum, Organic Guar Gum, Stevia Leaf Extract, Real Vanilla Beans, Probiotics (Lactobacillus Acidophilus, B. Longum, L. Plantarum), Protease Enzyme, Monk Fruit. Vitamin and Minerals: (Calcium Phosphate, Magnesium Oxide, Sodium Ascorbate, Niacinamide, Ferric Orthophosphate, Zinc Gluconate, Calcium Pantothenate, Ascorbic Acid, Vitamin A Palmitate, Pyridoxine Hydrochloride, Manganese Gluconate, Thiamin Mononitrate, Riboflavin, Ergocalciferol, Folic Acid, Biotin, Potassium Iodide, Chromium Chloride, Phytonadione, Alpha Tocopherol Acetate, Disodium Phosphate, Silicon, Cyanocobalamin). Add 2 scoops to 8 oz of your favorite non-dairy beverage, shake & enjoy.